Well, the curse has been lifted. After twenty-two years and six nominations, Leonardo Dicaprio has finally won an Oscar for his lead role in The Revenant. 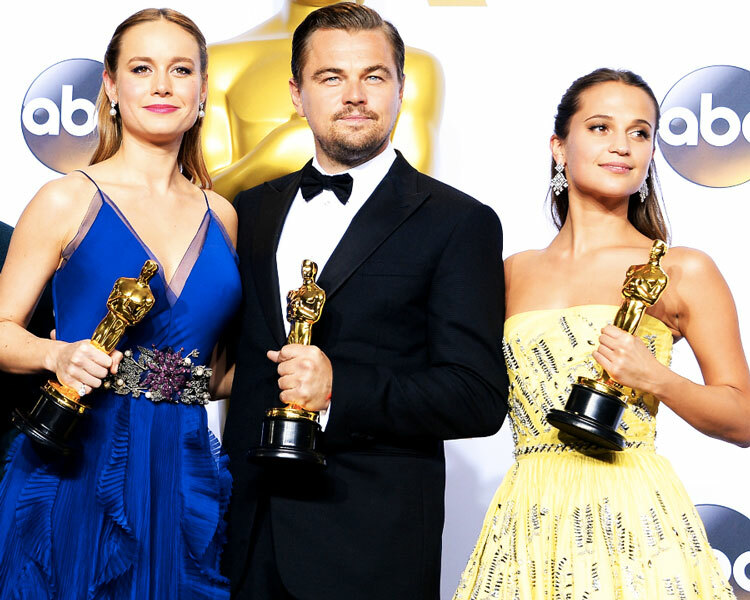 In other news, Spotlight took home the top honor, Brie Larson and Alicia Vikander won for lead and supporting actress, respectively, and Mad Max proved it was a technical feat with six wins. The 88th Academy Awards were a fun but politically minded affair, with Chris Rock driving home the importance of diversity in film and Lady Gaga delivering an incredibly powerful performance of her song "Til It Happens to You" from The Hunting Ground, a documentary about on-campus sexual assault. Leo stressed the importance of environmental awareness during his misty-eyed acceptance speech. Even Vice President Joe Biden was there! All in all, an entertaining evening that also reminded viewers how something as trivial-seeming as Hollywood has the power to influence politics and opinions. But let's get to the clothes, shall we? As usual, Hollywood's biggest and brightest turned up for the red carpet, dressed in couture and drowning in diamonds. I was delighted with the dresses we saw because celebrities weren't afraid to experiment with color, texture, and shape; in other words, it wasn't boring! (Last year's red carpet, if you'll remember, left something to be desired) The fashion risks paid off for the most part, and even the looks that weren't my favorites were not horrible. While there were plenty of gorgeous colors on the red carpet, the two most popular colors of the evening were red and white. Olivia Munn and Charlize Theron stunned in bright red gowns, letting the bold color do the talking, while Priyanka Chopra, Lady Gaga, and Olivia Wilde rocked gorgeous white dresses (well, technically Lady Gaga was wearing a jumpsuit). It seemed Daisy Ridley was channelling her Star Wars character, Rey, with her fun twisted updo. 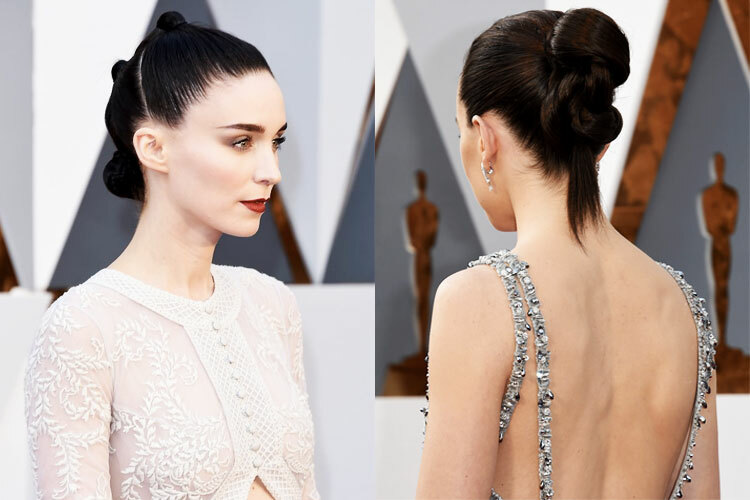 Elsewhere, Rooney Mara was also rocking a sleeker version of Rey's triple-bun hairdo, cementing the look as the second most iconic Star Wars hairdo yet (first place is reserved for Leia's classic buns, obvi). 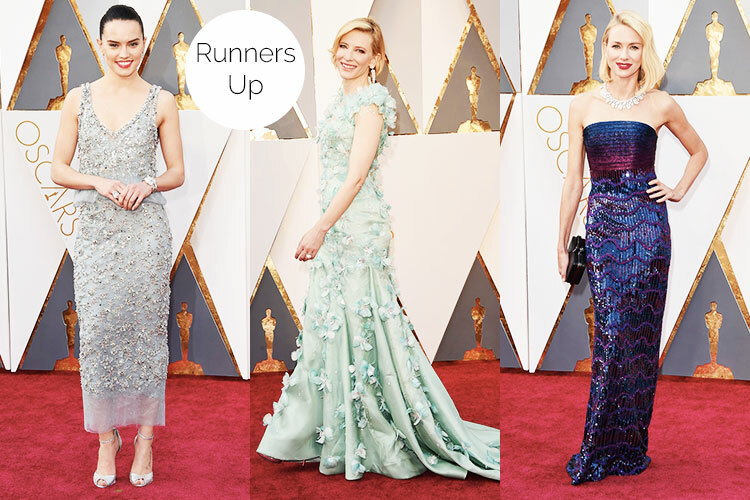 You can always expect to see some serious bling on the red carpet, and this year was no exception. From bits of embellishment (Julianne Moore—wearing a Chanel dress I was considering for Cate Blanchett—and Emily Blunt) to head-to-toe glitter (Daisy Ridley, Naomi Watts, and Margot Robbie) these ladies stole the show. Naomi Watts' Armani Privé look in particular caught my eye. Supposedly her husband picked it out for her; talk about a man with good taste! Alicia Vikander may have taken home the golden statue (and looking like a real-life Princess Belle while doing so), but I thought all the nominees for Supporting Actress looked like winners. I love that Rachel McAdams went for a more minimal dress in a striking emerald, and I adored Jennifer Jason Leigh's pink Marchesa gown. Kate Winslet went with a black dress as expected, but I like that she mixed it up with a really cool texture. Rooney Mara looked good, if not also a bit predictable. I'd like to see her get out of the white Givenchy dresses for once, since it's a look we've seen several times before, but I guess it works for her! Brie Larson won for Best Actress in a Lead Role, but her Gucci dress has me on the fence. The color is beautiful but made her skin look orange on television, and I agree that the ruffles and beaded belt are a bit too suburban prom for me. At least it's better than Jennifer Lawrence's Dior Haute Couture gown, which was too heavy on her and just generally not exciting (I would have prefered the tea-length runway version, actually). Saoirse Ronan and Cate Blanchett both dazzled in green gowns, and Charlotte Rampling looked absolutely elegant in Armani Privé. Seriously, this kid has more swag than most people will ever attain in their lives, and he's only nine. And he's wearing Armani. To the Oscars. Also, did you see his face when C3PO, R2D2, and BB-8 came on stage? Too precious. 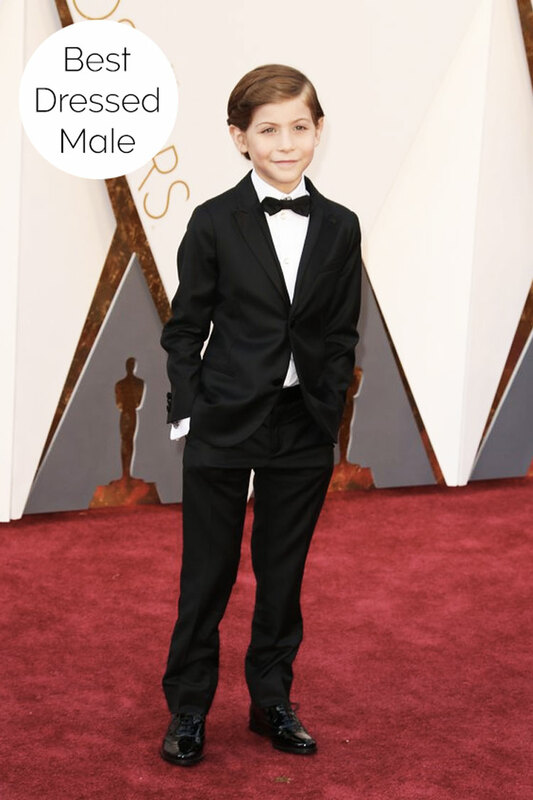 Leo may have won the Oscar, but Jacob Tremblay was the true star of the night. Alicia Vikander was simply the Belle of the Ball (pun intended) in her yellow Louis Vuitton dress (hey, I called it that she'd be wearing yellow!). Between the dress—note to self: the bubble hem is making a comeback—the earrings, and the fun yet laid-back hair, Vikander was one of the first looks I saw in the evening and made a lasting impression. What were your favorite red carpet looks? Tell me in the comments! I LOVED all of the fashion! I was so pleased with all of the winners, and how stunning everybody looked! It was a great show! Me too! I wanted Cinderella to get Best Costume Design, but other than that it was a great evening for film and fashion! Thanks for reading, Elise! There wasn't anything that was incredibly jaw-dropping, but Alicia Vikander's entrance was the closest to it. Margot Robbie always looks great, she could wear a paper bag and I would be impressed, haha! Oh no! Well, the good thing about the internet is that you can watch all the highlights and speeches the next day and skip all the boring parts. Thanks for reading, Molly! I do agree that there weren't any super dramatic looks, one way or the other. In particular, I was hoping that Lady Gaga would don something a bit more eye-catching. I loved her jumpsuit but it still felt very simple for me, tbh I was waiting for her to show up in that Moschino chandelier dress that I had picked out for her! Mine too! Thanks for reading!